the reporter lady’s hair is pretty clearly made of cement. 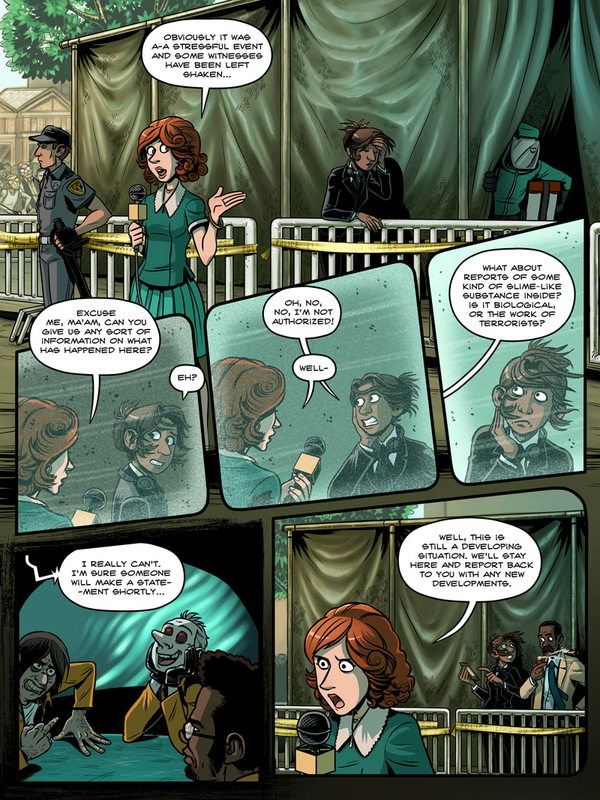 Is it just me or is that TJ from <Epic in the background of panel 1? Another beautiful page… I can’t stand how sweet Schtein is in that lower left panel. I hope he and Delia can reunite soon. And the way Krow’s looking at him, ha. Anyway, not sure if I’m excited or horrified of finding out what a ‘secreter’ is. I mean, obviously someone who secretes goo, but I’m hoping it’s a power and not just something they do all the time… Goo sure is gross, man. Especially when its bio hazardous and or nuclear. That’s some damn good hairspray she’s using. The second-to-last panel is soooo gooood! 2am here and I can’t stop laughing whenever I take a peek. Every face drawn is oh so cool. All show drastically different emotions, and yet they fit. Marvelous! I’m assuming this slime guy was the same kid in page 13 on the monitors? Ah yes, the kid picking his nose. Gross! Is that TJ from TJ and Amal I see in the crowd? Man, I can’t get over how amazing your art has become! Absolutely gorgeous! oh, whoops. See, sometimes working really zoomed in does this where you don’t notice dumb things like that. Finally, i was beginning to think that this page would never come, great job as always comrade. Schtein looks so happy :), but I wonder whats making Krow so mad? racism is making him mad. also, yes, sorry, the page took a while. I’ve been fairly sickly all month and it’s taking its toll. Please don’t apologize. If you get ultra-ill and feeble, you won’t ever make a comic again. Take care of yourself! And get that new spouse of yours making up some oxtail soup on the double. ok, I am a part time idiot, so kindness is requested please ^_^ is Schtein going through some dream? I thought the pretty one was dead, and the tanned one was gone as a betrayer? The comic is flashing back to the time index where Schtein was still in prison, watching Osgood on TV news. Delia’s right ear looks strange in panels 4 and 6.
its beautiful. Don’t worry, i can tell you spent a lot of time on it. I hope whatever has been bugging you is gone for good!!! Huh. The more I see Krow, the more I realize he looks like a less pathetic Spoony. Schtein with little hearts popping above his head. The body language of some of the background characters (notably a disgruntled bio hazard person) are the best . Where does the sudden gust of wind come from? Why does it only seem to affect Osgood and her boss, but not the lady reporter, and why doesn’t the reporter notice? Is that some psionic power going off? Is that why Osgood is pointing at her PDA? Did anyone else go back and compare this page with page 43 of Chapter 3?